Ah, Steel - "'Diversity Hire' Superman" as some have called him. He's a normal human (a technological genius, but still a normal human) who was inspired by Superman to take up the neverending battle for truth, justice and the American way. Because if there's anybody that "the American way" has been unfailingly kind to, it's a black guy from the South. Anyway, Steel looks great as a Minimate: he's dark grey and silver, with just the right balance between sculpted parts and painted designs. The boots, belt and wrist cannon are new, as is the big chest cap that's S shield, shoulder armor and red cape all in one. Black paint apps define the tech on the boots, the abdominals and the helmet - it's not just the face, but also seams on the back of the head. He's armed with his hammer, and just looks really good over all. 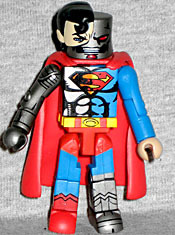 Next we have Cyborg Superman, a character who'd already been impossible to find in two toylines before this release (DC Direct and DC Superheroes), so there was no way I was going to skip this one. His add-on parts were so minimal that not even Rustin could hate on him: he's got the same belt and cape as Superman, and a "half face" with hair, similar to the Marvel Series 2 "Spider-Sense" Peter Parker. If you pull the face off, the head beneath is detailed even where you wouldn't see it. Nice work! The rest of his details, all the robot stuff, is just painted on, which keeps him looking sleek and menacing, rather than bulky and lame. The fading colors on his S shield are particularly well done. This set really seemed like the start of something - in one shot, we got half the Reign of the Supermen crew. Another two-pack would be Superboy and Eradicator, then Supermullet and a 3" Doomsday. But because the DC Minimates failed to click, we're left hanging. This entry was posted in Art Asylum, DC, MMMR and tagged Minimates, Superman. Bookmark the permalink. 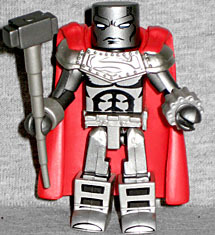 Its so true - I don't even hate Minimate Cyborg Superman... I love him!